I have spent the year so far struggling with reading. I think my mind and inner reader have demanded a slow down and when I acknowledged that and still refused to do it, she shut down on me. It got so bad that I had started wondering what I ever enjoyed about reading in the first place. While intellectually I could recall all the reasons I've always defended reading and found it enlightening, emotionally I simply couldn't connect. I've been struggling with depression this year, for a reason to keep on keeping on and to me the ultimate manifestation of that had to be the fact that I could no longer read. And then, behold, a gift from the reading gods. I read two books in quick succession that I loved so much I cannot express my gratitude for them. I was reminded why I love to read, why I need to read, why books must always be a part of my life. Stories have a way of shooting out threads of hope and light beyond the darkness that can sometimes surround us. Words claw their way past the defenses we don't even know we have constructed. They remind us we are not alone, they help us find out way. They are not on their own enough, of course, but they can often be the tool that reaches us when we feel unreachable. You are my Only by Beth Kephart was the first, I'll share more about that later because it's a brilliant work. But today I want to tell you about The First Husband. 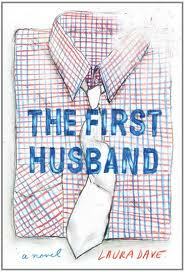 The First Husband is what I would call chick lit. Setting aside all the ways in which that term is offensive, I have always thought chick lit was essentially this: a book written about a woman who goes through a period of self realization, often heavy on the humor and heart. Forget shoes, forget the romance, the reason I always loved chick lit in the past was because I felt like for the first time ever someone was taking my stage of life seriously and telling a story about it. I suppose if I were to go back and read the books I loved most then, now, I might feel differently, but at the time that's why I loved chick lit. I don't read much anymore, it's a genre, in my opinion, that is incredibly difficult to write. So when people jumped on the bandwagon and tried to have that light breezy voice that was necessary, the humor often felt overdone and ridiculous. And it can't be just funny, it needs to hit on some essential truth. The market was flooded and then it was renamed romantic comedy or just women's fiction, but I always felt some loss for the kind of book I had loved that seemed harder and harder to find. So when I say The First Husband reminds me of chick lit, it's really really important to me that it's understood that it's a compliment and there's no reason in my mind anyone should shy away from reading it for that reason. It's a beautiful and heartfelt book with just the right amount of humor. Annie Adams is pretty content with her life. She's a successful travel writer, she's living with her boyfriend of five years, and she has a dog she adores. But when her boyfriend breaks up with her, it sets a series of events in motion that cause her to reflect on her life and decide if she is really living the life she wants to be living. When her best friend gives her the advice to "be the opposite of you" she does just that and ends up married to the first guy she meets after the break-up and moving across the country. There are many things she doesn't know about her new situation that kind of hit her in full force and more stuff happens and she's forced to decide if this is really what she wants when it's so completely opposite of what she thought she always wanted. The First Husband is about so many things. It's about love and deciding what you can live with and what you can't live without. It's about making choices and understanding freedom in a new way. In my opinion, Annie faces down what she fears, which is essentially commitment. And it's all written with a light touch, so you can empathize, laugh, and enjoy her story. "In the end--even if no one wants it to be so complex (or so simple)--every place offers its own special treasures. But no place offers all of them. Which no one wants to hear. Because it puts it ultimately in our hands, doesn't it? What we choose to live with, and what we choose to live without." The First Husband is pure delight. It's everything a good book should be--funny, smart, relateable, wise, and full of heart. I can't recommend it enough. Things You Might Want to Know: some language?